Three years ago, Darrell Raikes developed sepsis after a routine knee surgery. He survived but, like many sepsis survivors, his life was irrevocably changed. Prior to having sepsis, Darrell was a mechanical and tooling engineer for more than 30 years. Since surviving, he’s found a new purpose in life. 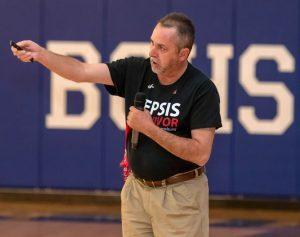 A self-described “country boy,” who speaks with an endearing Kentucky drawl, Darrell is now a dedicated sepsis advocate. 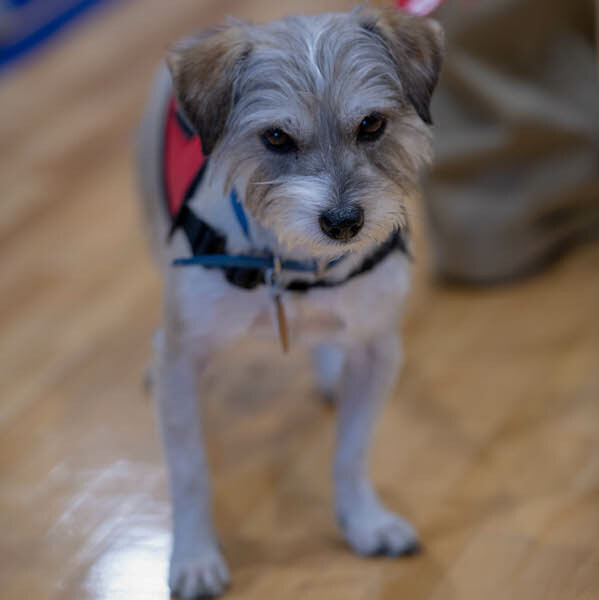 Accompanied by his service dog, Harvey, Darrell travels across Kentucky and the country raising sepsis awareness. Once a week, Darrell volunteers at the UK HealthCare ICU department visiting patients who are in the same position he was three years ago. He offers them compassion, advice, and hope. But as Darrell said, “That ain’t all the volunteering I do.” There is so much more! Darrell and his wife, Sarah, partnered with Family, Career and Community Leaders of America (FCCLA) Kentucky chapter to raise sepsis awareness and support Sepsis Alliance. Darrell also hosts an annual fishing tournament to raise sepsis awareness. In addition, he was recently invited to speak at the 2019 American Delirium Society workshop. Delirium affects many people while they are treated in an ICU. In recognition of his dedication, Darrell was named 2019 International ICU Hero of The Year by the Society of Critical Care Medicine. Sepsis Alliance had the pleasure of interviewing Darrell for Sepsis Survivor Week. Keep reading to learn what inspires him. Has sepsis left you with any long-term challenges? What keeps you going when you are dealing with all these things? What inspired you to have such a positive outlook? I want to help others. What I try to do is rest 50% of the time and I try to be productive 50% of the time. When I say productive I don’t mean digging a ditch for eight hours because I can’t. If I was told, “Darrell you can go back to being engineer and living another 15 years, or you can stay with your current health and you’ll die 15 years earlier,” I’d choose to stay with my current health because I know I am making a difference. How has your life perspective changed since you survived sepsis? It makes you more appreciative of every little thing. When I was an engineer for the automotive industry, Ford, GM, Toyota, or whoever I was dealing with at the time, they thought their car parts had to be there tomorrow and we had to drive all night just to get them there. When you volunteer in the ICU and you see these people that you don’t know if they are going to live or die, or even be there next week – a car part is nothing in life. You do a lot of volunteer work with patients in the ICU, can you tell us about that? What I do is I go in and first I see the social worker, and the social worker in the hospital knows which patients need comfort, encouragement or not. So, I go to the rooms that they tell me to. I try to encourage them that they will get better, they will recover. Things may not be the same, but they are ok and they’ll learn how to manage things. I was saying the other day that when a patient is in the hospital, it is important for the nurse to walk in with a smile. It’s important for the nurse to touch you, and it’s important that they look you in the eye and talk to you, either discuss what procedure they are going to do, or just talk to you. You don’t want to be treated like a vegetable laying there. Touching is a medicine in itself. When I volunteer with a patient, I ask permission if I can touch their feet because I won’t remember their names – I’ve been left with cognitive issues. So, when I get back to my truck I just pray for everyone that I have touched that day. That ain’t all the volunteering I do though. My wife is an FCCLA teacher. The whole state of Kentucky made it their project to raise money for Sepsis Alliance. Every school competes against each other to raise money. A lot of schools want me to come around and give a presentation. So, I’ve driven two and a half hours to give a 30-minute presentation. 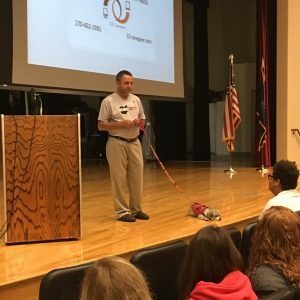 So, I’ve been to about 40 schools in the state of Kentucky to give presentations. I’m also working on a bill. I met with the health commission in the capital and they said I needed a sponsor for the bill. So, I got my local state senator, Jimmy Higdon, to sponsor the bill. So, my goal this year is to get the bill passed so sepsis protocols are in every medical facility in Kentucky. What inspires you to volunteer? Finally, it was just time and I said, “I can’t do it.” So, I talked to my doctor (Ashley Montgomery, MD) about it and she said she had a plan for me. She’s the one that got me volunteering. What she told me is that most people that went through what I went through would still be laying on the couch three years later. Then she asked me “how would you like to volunteer in ICU?” I said I would love it. What advice do you have for other sepsis survivors who are struggling in their daily life? You’ve got to find your purpose, because if you don’t you’ll be depressed. Go out and find something to do that makes you happy. Do you have any closing words you want us to know? When I die, I won’t be remembered as a tooling engineer with no purpose. I’ll be remembered as a sepsis advocate. To read about Darrell’s sepsis experience, click here. To follow Darrell’s journey, you can visit his blog at http://www.ez-caregiver.com/blog. For information and resources for sepsis survivors, click here.